After prepping 28 slow cooker freezer meals with my mom I decided to freeze some meals for the grill too. Chicken breasts were BOGO at the grocery store, so I bought 10 pounds, marinated it, and froze it for the grill. Now we’re stocked for the summer! 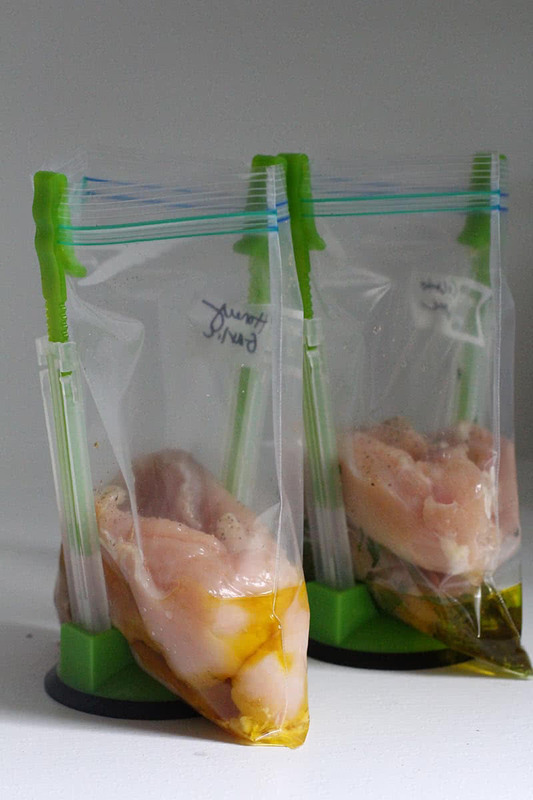 The best part was that these marinated chicken packs were so easy to make. 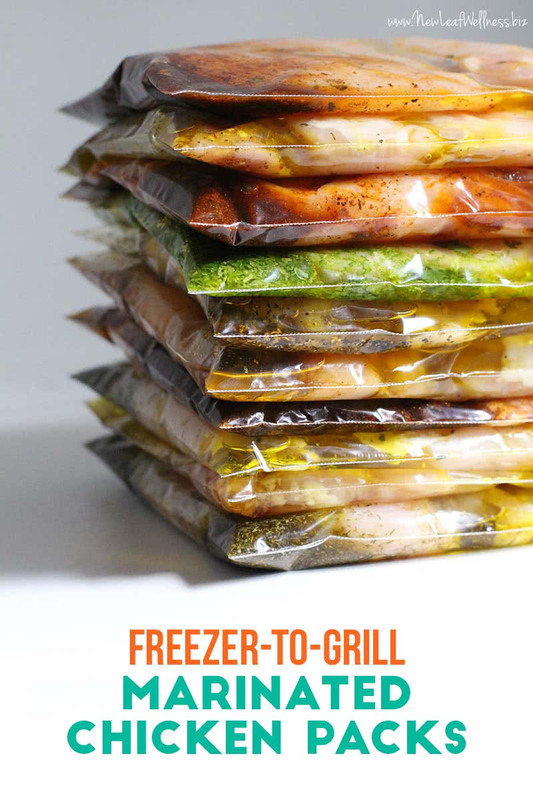 It took me all of 20 minutes to combine the chicken and marinades in freezer bags and pop them in my freezer. Now all we have to do is thaw them and put them on the grill. 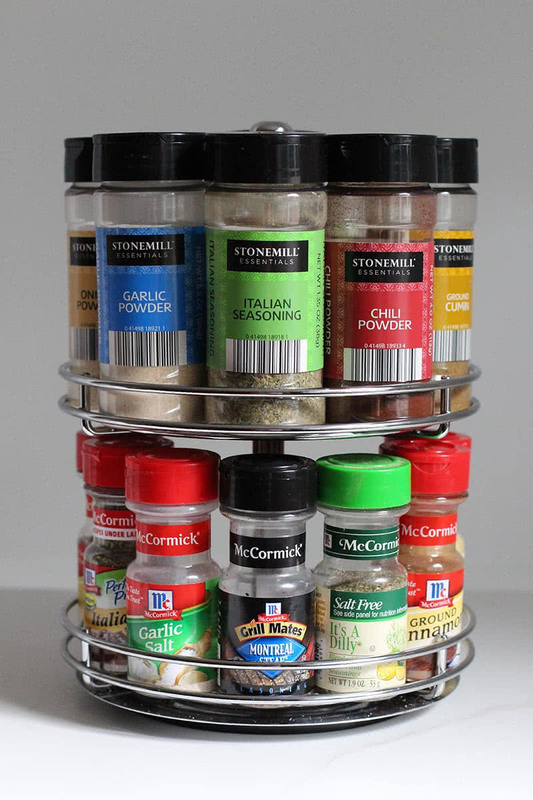 I already had extra virgin olive oil and seasonings on-hand, so I only spent $32 on ingredients! 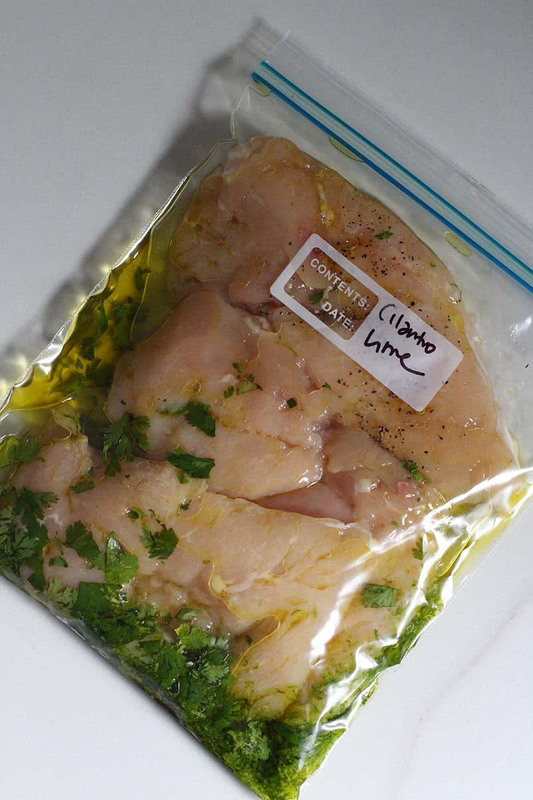 That includes 10 pounds of chicken, quart-sized freezer bags, and fresh cilantro and lime for one of the marinades. 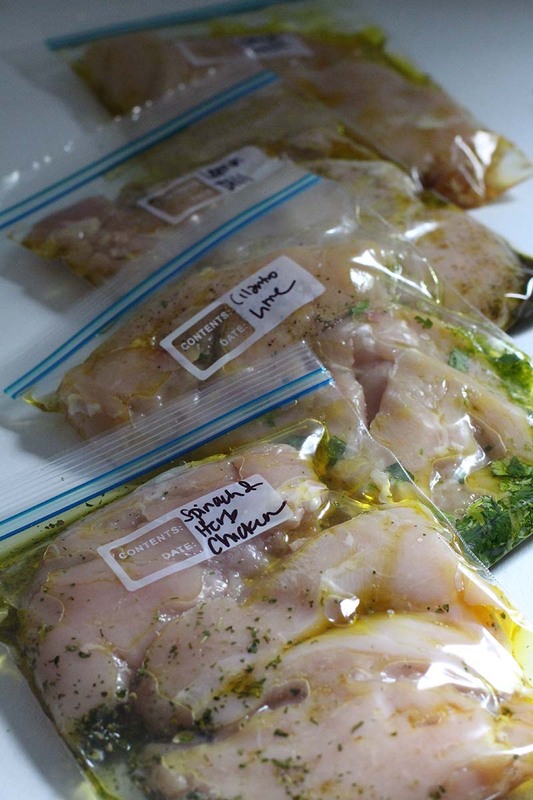 Simply add to a freezer bag with one pound of chicken breasts, 1/4 cup of extra virgin olive oil, and a pinch of salt. Freezer meals last in a standard fridge/freezer combo for three months so now we’re set for the summer. Serve with a big salad or steamed broccoli with rice and dinner is done. My plan is to thaw the chicken freezer packs in the refrigerator overnight or in a pan of water before cooking. Then they only need to be grilled for 6-8 minutes. So easy! 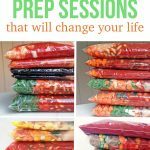 If you’ve never prepped and frozen meals raw before, prepare to be amazed. There’s no easier way to make cost-effective and delicious meals. 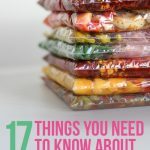 You can find tons of tips and recipes in my “no-cook” freezer cookbooks. Hey, I love this idea. I’m just wondering, do you bother to flatten or pound the breasts at all before you put them in the bags? It’s not necessary, but I do when I buy really big chicken breasts (ones that weigh a pound or more each). Hi quick question, have you found this method to work well? I am researching new methods of cooking and through some google searching found that chicken should not be marinaded longer than 2 days? Have you cooked the frozen chicken? Did it work well? Also, I cook for one, any recommendations? Should I just freeze enough for one meal for use portions and keep the rest frozen? Yes, we are really loving the frozen packs. I agree that meat should not be marinated for long periods of time, but I don’t think the time in the freezer counts. If I were you, I’d freeze the chicken in portions that you want to cook at a time. I think the danger of a long marinade is particularly true of acidic marinades. Because Kelly’s recipes here use only oil, herbs and seasonings, including citrus zest but not juice, they work. I think when the marinade is acidic the time freezing and thawing (and maybe in the freezer too?) can negatively affect the texture of the meat. 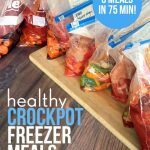 I have made chicken, pork and shrimp freezer meals with marinade for years. They always turn out amazing. The marinade starts working on the chicken but stops as soon as it starts to freeze. As it thaws it starts working again. Dive in. So does that mean these same marinades can work with any protein? 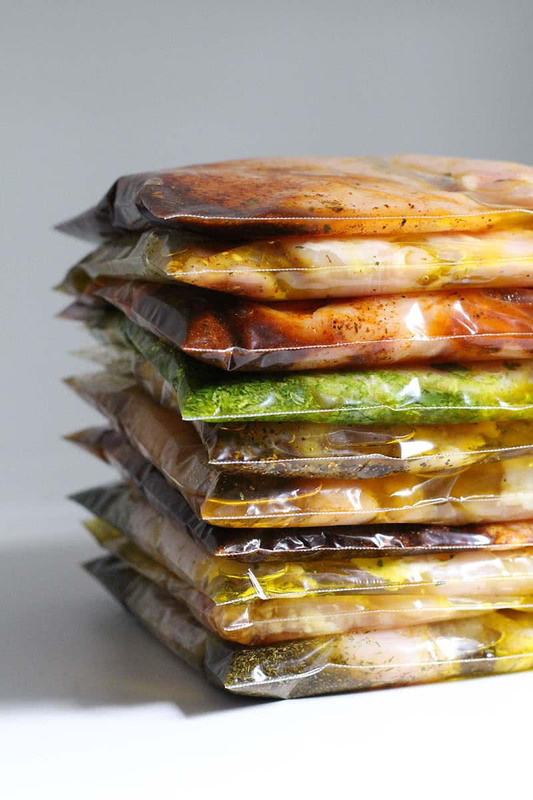 I have had no problem cooking these frozen chicken, make ahead meals. Freezing rather stops the margination process, but when you thaw them, it starts to marinate again. That caution applies if your marinade contains acid, like lemon juice or vinegar. Over-marinading, in that case, will break down the chicken and cause it to become mushy. 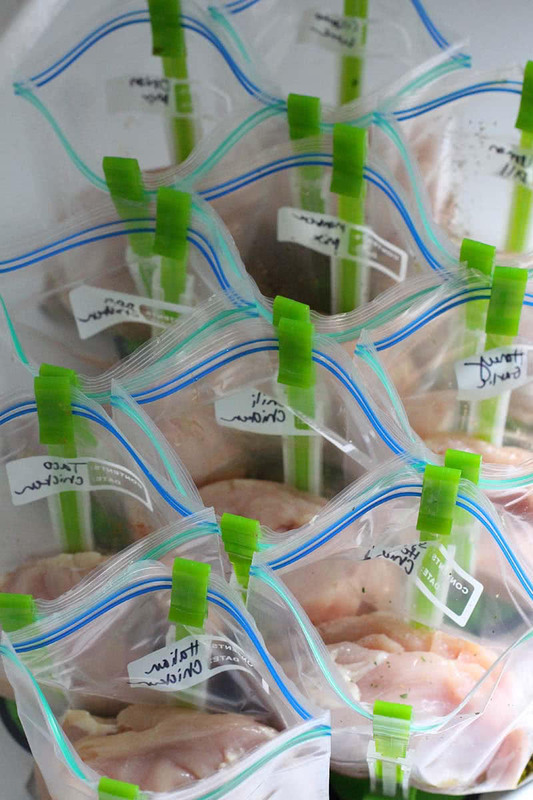 Overnight thawing of frozen marinaded chicken in the fridge or quick thawing in COLD water shouldn’t cause any problems. I order my chicken from the butcher a few different ways including thin sliced and cut for kabobs. When I want buffalo style I order the chicken for kabobs and marinate only for an hour in hot sauce. I put the chicken on the skewers then grill up real quick. After they are finished I out all the skewered chicken on a platter and ten dice up carrots and celery and load the veggies on top of the chicken. Lastly I pour blue cheese dressing on top of everything and serve. I have a meat tenderizer that I bought from QVC that pokes holes in the meat. It is great for marinating. All the seasonings are throughout the meat when done. Awesome! I bought the same one and love it even for my rubs! May try my rubs this way too. Yay! I’m so glad to hear that, Fede. Thanks for the encouragement. 1. Cuts of chicken: I notice all your recipes calling for chicken use boneless breasts only. Have you used other chicken cuts – boneless tenderloins, boneless thighs? Are there any points to consider if changing out the type of chicken? 2. meat portions: When you set aside one pound of boneless breasts, how many people do you plan for one pound to serve? what is the rule of thumb for amount of meat per adult being served? I love the idea. I am not very organized. With the kids going back to school everyone is always on a different schedule. When I read the portion of 1lb of meat I was thinking hmmmm…so I was reading through your comments for your thoughts on portions. No wonder my grocery bill is so high. We need at least 3 to 4 lbs of chicken for a family of 5! We don’t each very many carbs so the sides are likely a salad or fruits. Shannon, you are not alone! I always cook 3-4lbs of protein for our family of five (two adults, 2 teens and a growing 7yo). We are also a lower carb intake family as well. I asked Kelly about the boneless skinless thighs last year. They work great in all her recipes! We buy them through Zaycon and they are amazing. They are so large that I only use 2 – 3 per recipe for a family of 4! They were bought at the grocery store a few months ago. Head country makes a dry seasoning that is amazing. My family prefers smaller portions rather than the whole chicken breast. I usually take my kitchen shears and cut the large breast into two or three smaller portions. Grilling time is also less! Thanks for all the good ideas you share with everyone! We’re doing a lot of grilling at the moment, and I usually marinate the meat in the morning or day before. However, I’ve never tried the frozen method. My question is whether the meat actually marinates while it is in the freezer, possibly a dumb question LOL, or does it marinate whilst defrosting? To be honest, I’m not sure how it works. Haha. My guess would be while it’s thawing, because if it was actually marinating while in the freezer that would be a long, long time.